A trip to Ireland isn’t really complete unless you take a road trip through the country. There are so many things to see in Ireland including Irish castles, historic sites, and beautiful scenery. Add to that cute towns and some of the friendliest people you will ever meet. We traveled clockwise as our Ireland road trip itinerary took us from Dublin to Kilkenny, Waterford, Kinsale, and Galway, with lots of stops in between. 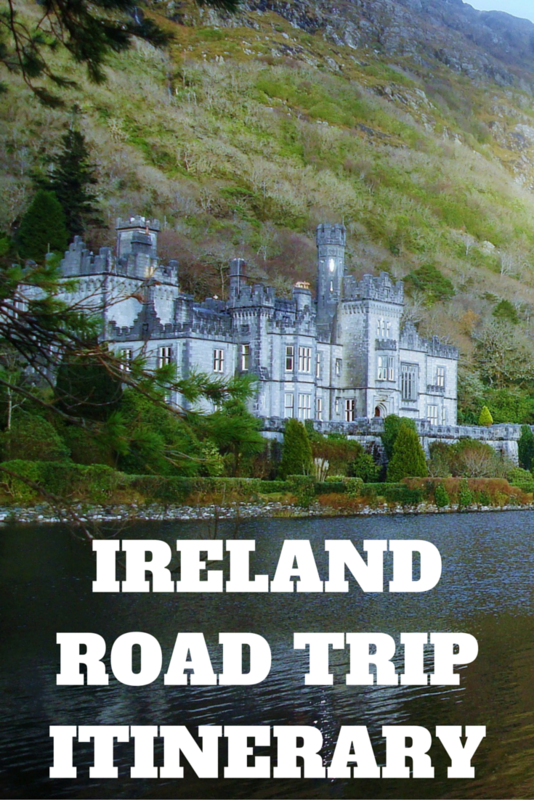 A what to see in Ireland list could go on forever, but here are some of the top things to see in Ireland on a road trip. You know those places with circles and shapes in the ground that can only really be appreciated from the air? The Hill of Tara is one of those. The Hill of Tara is located in the County Meath. It is a sacred place which was believed to be a dwelling of the gods. During the Stone Age, it was a site for a passage tomb. Those circles are ring forts. 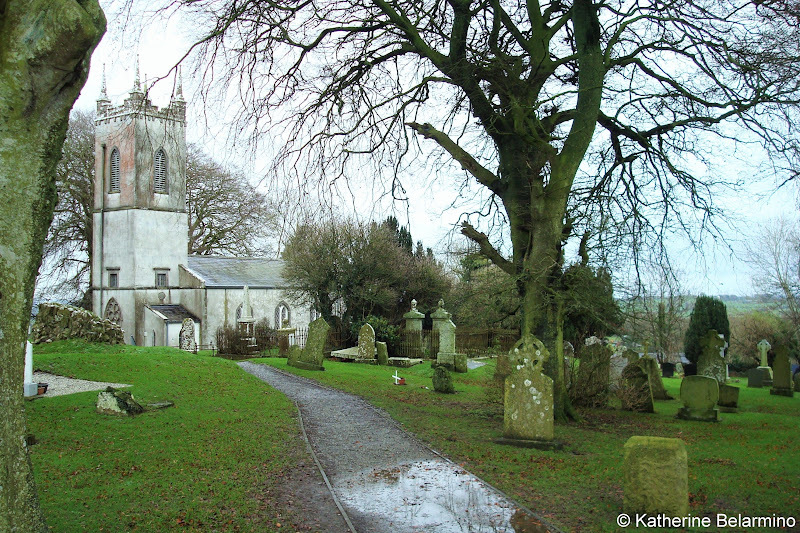 On the Hill of Tara can also be found the Stone of Destiny, a statue of St. Patrick, and a church and graveyard. The Hill of Tara also provides a grand view of the green countryside. Newbridge House and Farm is a Georgian Mansion that can be visited on a guided tour. This large Georgian estate belonged to one family from when it was built until it was sold to Ireland as a visitor site, and it retained all of its original furniture and art. There is also a working farm, making this a great place to visit for families with small children. Powerscourt House is one of the grandest estates we visited during our Ireland road trip. While it has a lovely restaurant inside, the Avoca Terrace Café, where you can lunch, the real draw of Powerscourt House is the gardens and waterfall. 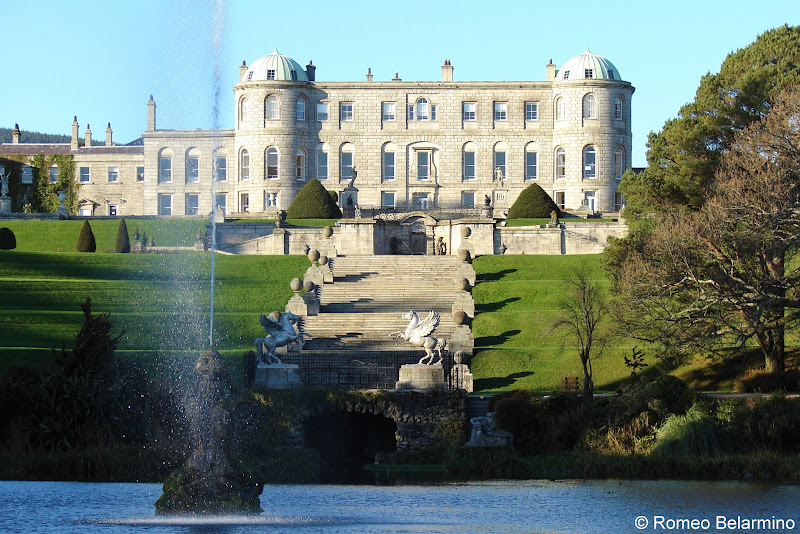 Powerscourt Gardens are 47 acres of lawn, tree plantations, and formal gardens. The Powerscourt Waterfall is the highest waterfall in Ireland. Be sure to visit the pet cemetery with rows and rows of graves of Powerscourt pets including dogs, horses, and even prize-winning cows. 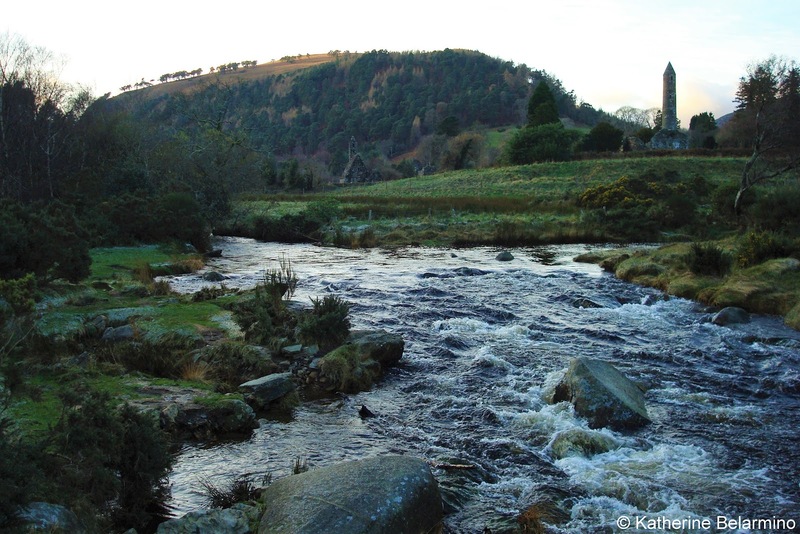 Located in Glendalough are the ruins of a monastic settlement. 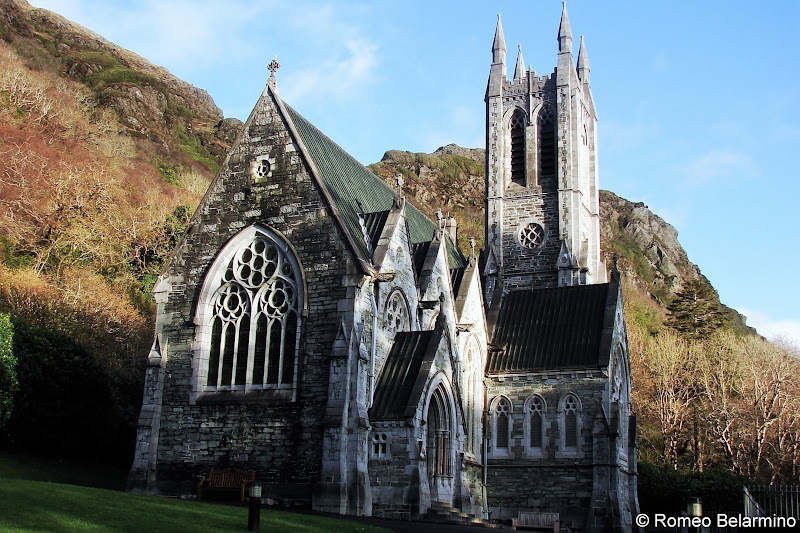 This monastic site, founded in the 6th century by St. Kevin, is one of the most important in Ireland. Sites in the monastic settlement include the Round Tower that is 30 meters high, St. Mary’s Church, St. Kevin’s Church, the Priest’s House, and large granite crosses. The scenery around the site includes two lakes. 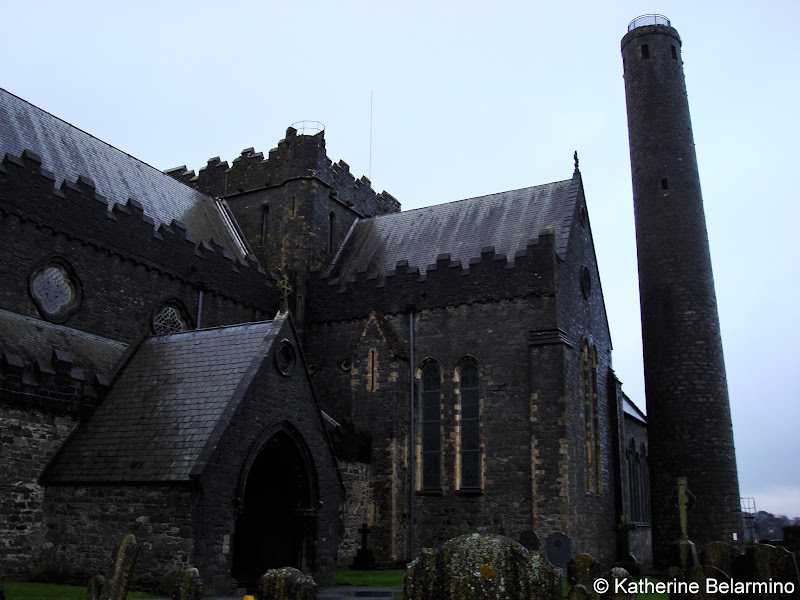 St. Canice’s Cathedral is located in Kilkenny. The site was founded in the 6th century, a cathedral was built in the 13th century, and the Round Tower, built in the 9th century, is the oldest structure in Kilkenny. Visitors can enjoy the colorful stained glass and old tombs and climb the Round Tour. 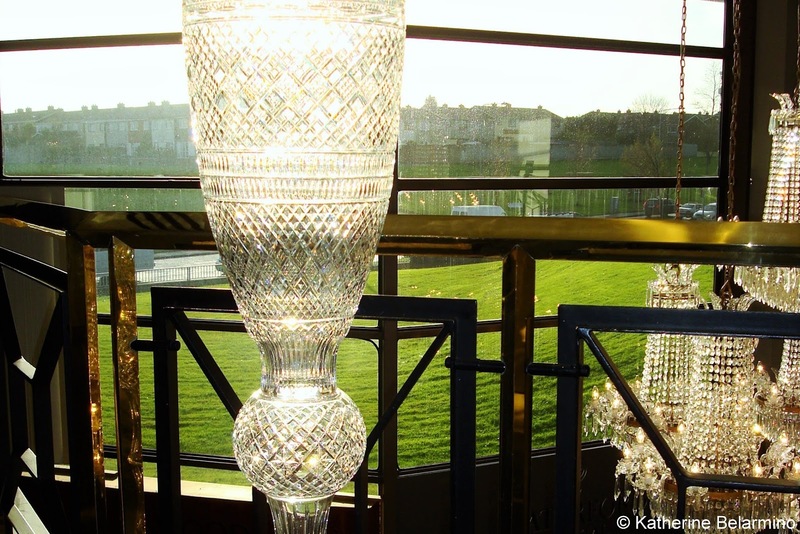 Waterford crystal is an icon of Ireland. Waterford crystal has been manufactured in Ireland’s oldest city, Waterford, since 1783. Waterford has made countless well-known pieces like sports awards and the Times Square New Year’s Eve Millennium Ball. Waterford Crystal went through a financial crisis and was sold to a US equity firm in 2009. It seemed like the production of all Waterford crystal would be outsourced to other countries, which would be a shame as it takes years for the skilled artists of Waterford Crystal to become master cutters. However, in 2010 the new owners signed an agreement with Waterford City Council to open a new manufacturing facility where visitors can take guided tours and witness the manufacturing process. In Waterford, Ireland’s oldest city, is Ireland’s oldest civic building, Reginald’s Tower. The old city wall and original tower were built by the Vikings after 914. The tower was rebuilt in the 12th century and more floors were added in the 15th century. The tower is open to visitors and has an exhibit on the Waterford of the Viking era. 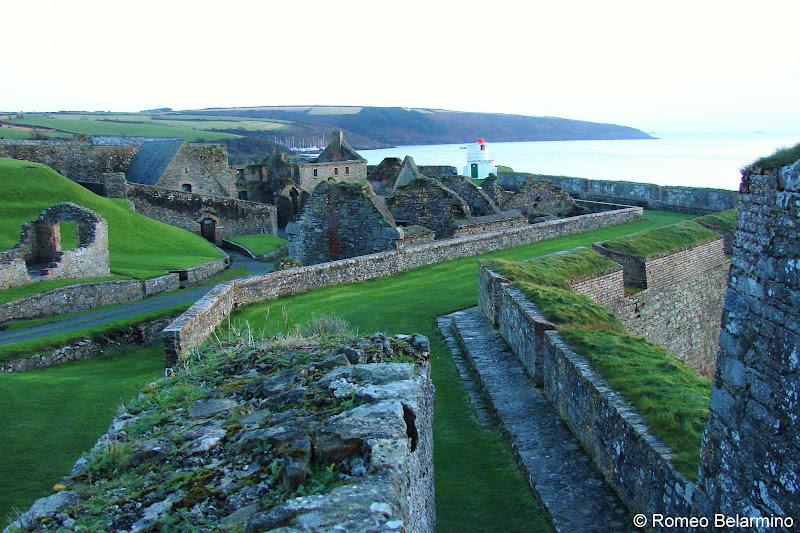 A very different site from the others along our Ireland road trip route was Charles Fort in Kinsale. Charles Fort is a 17th-century star-shaped fort and one of the largest military installations in Ireland. 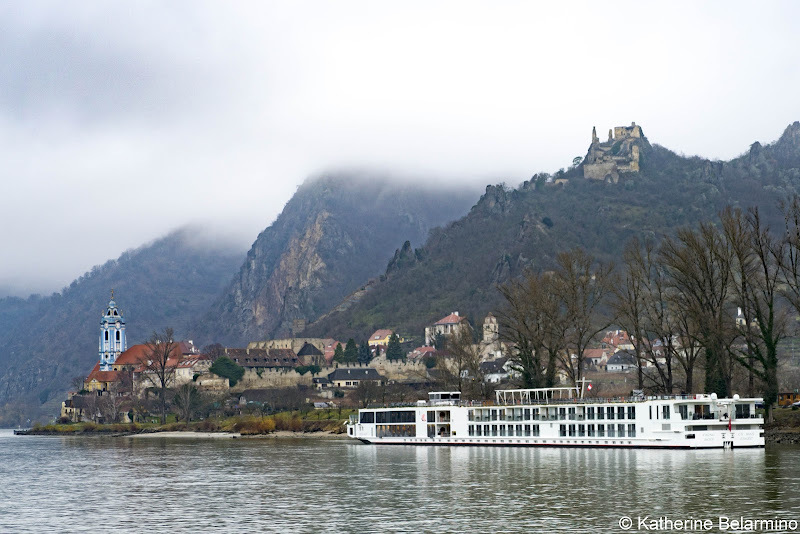 Be prepared for lots of walking as you’ll want to walk the bordering walls and explore the ruins of this large fort. 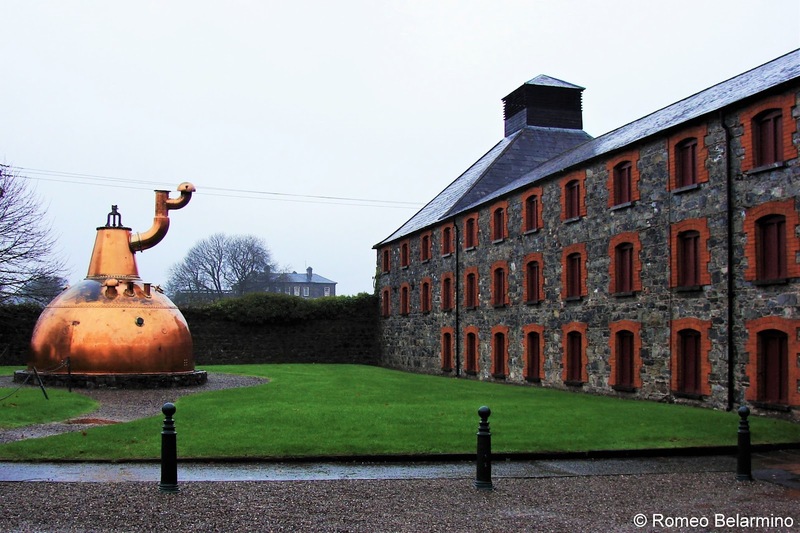 There is an Old Jameson Distillery experience in Dublin, but if you’re taking a road trip through Ireland, visit the Jameson Experience in Middleton, near Cork. This Jameson Distillery has been around since 1795 and the tour visits the kilns, mills, water wheel, and warehouses spread out on 15 acres. After seeing how Jameson Irish Whiskey is made, the tour ends with a tasting and a certificate stating you are now a certified Irish Whiskey Taster. 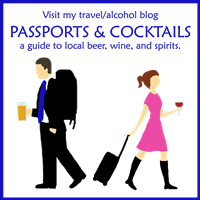 If you’re like Rome and prefer Scotch whisky, you may want to keep that little tidbit to yourself, but luckily our tour guide didn’t kick him out or withhold his certificate, and I personally enjoyed the Irish whiskey best because it has a little sweetness. 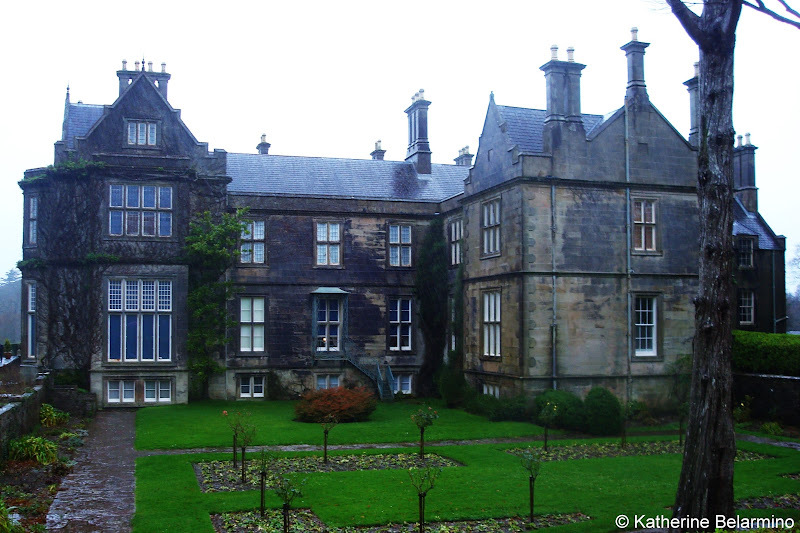 Muckross House is a Victorian mansion on the shore of Muckross Lake in Killarney National Park. The estate was originally built for the Herberts, but at one point it was purchased by the Bourns, a California couple, for their daughter’s wedding. They even had a home near San Francisco with murals of Muckross. The Bourn family gave the estate to Ireland as a memorial, and the estate became Ireland’s first national park. Kenmare Stone Circle is kind of like Stonehenge, but a whole lot smaller. 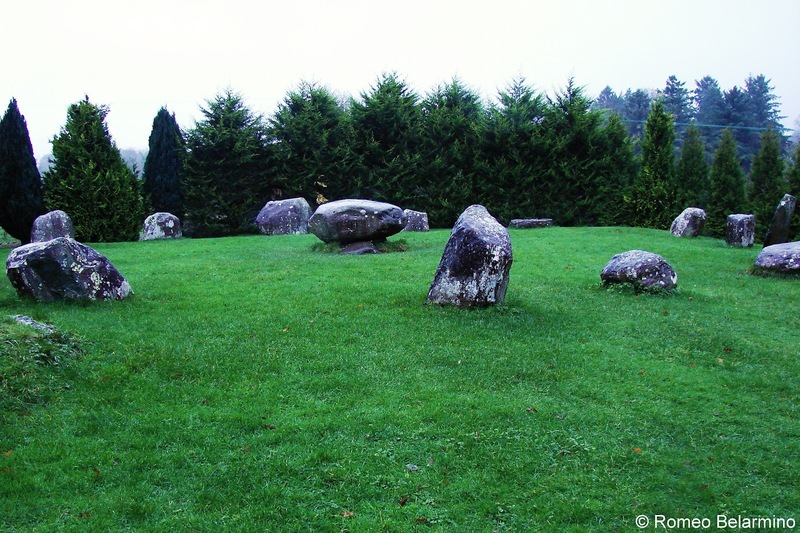 The stone circle is from the Bronze Age and is the largest stone circle in southwest Ireland. 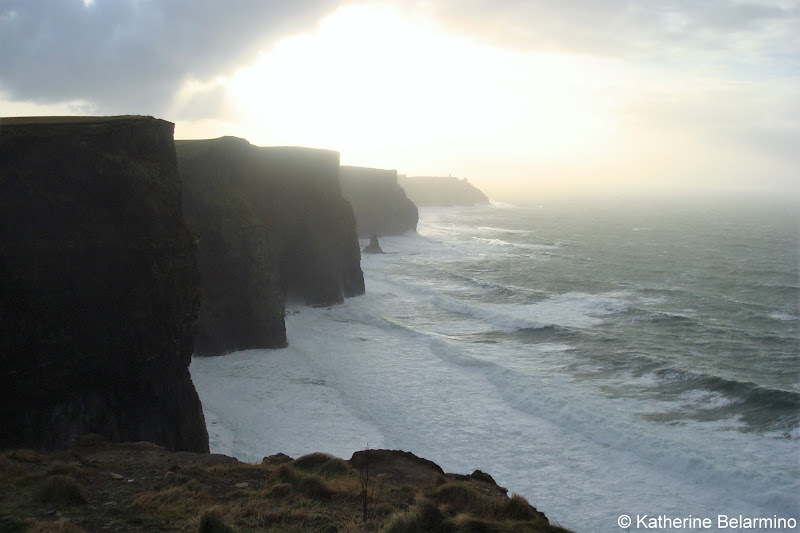 One of the most beautiful places to see in Ireland is the Cliffs of Moher. It’s hard to understand until you see them in person. The cliffs are a sheer 702 feet at their highest point and curve along five miles of the Atlantic coastline. Warning signs are posted because the strong winds can literally blow you off the cliffs into the churning ocean far below. It was so windy the day we visited that sea foam was blowing through the air and the gusts would physically move us. Luckily there are walls built to keep you from being blown away. Along the Cliffs of Moher is O’Brien’s Tower where travelers can get an even higher point of view. The Burren is a desolate looking area of Ireland covered in limestone and short, sparse plant life. Large stone tombs, called dolmen, can be found in the middle of the Burren. 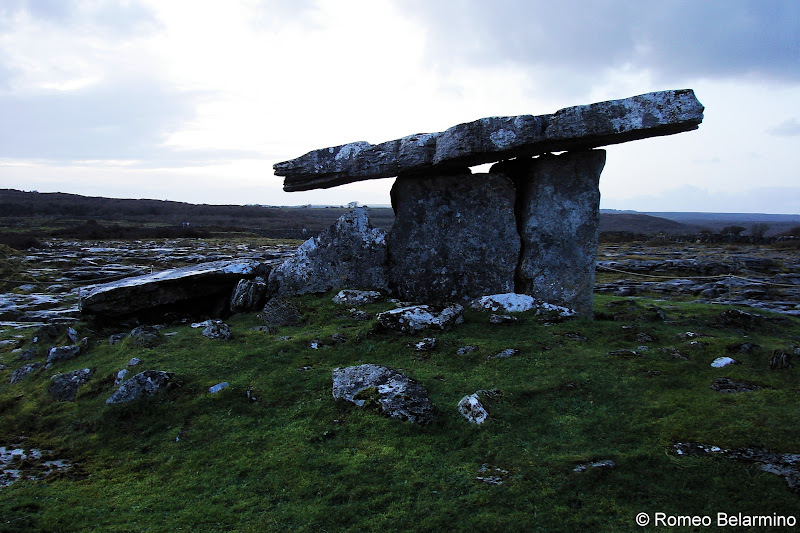 There are over ninety megalithic tombs, leftover from the New Stone Age, in the Burren. The earliest examples are the portal tombs, and the Poulnabrone Dolmen, which means “the hole of the sorrows,” is one of the best-preserved in all of Ireland. 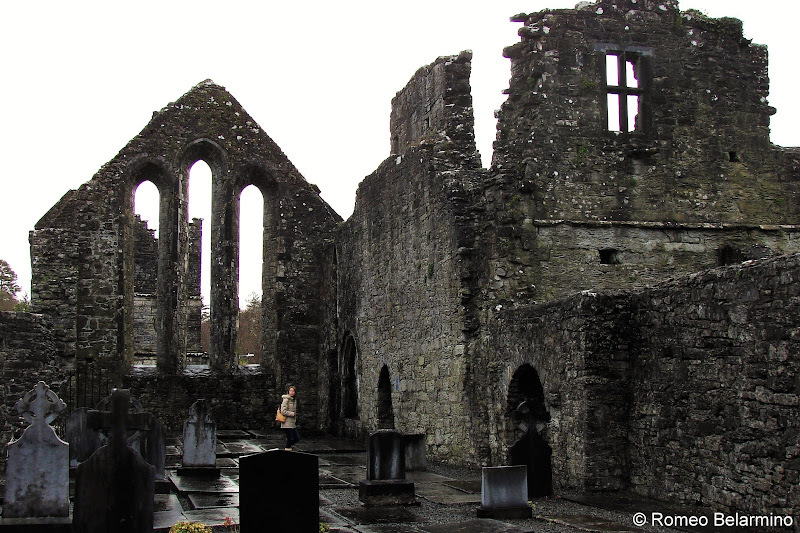 Another beautiful set of ruins to be visited on a trip to Ireland is Cong Abbey. This monastery was founded in the early 7th century and was refounded in 1135 after it was destroyed by fire. The current abbey ruins remain from the rebuilding in the early 13th century. A fascinating little building on the property is the monk’s fishing house. The fishing hut was built in the 15th or 16th century and was used by the monks to catch fish. Built on a platform of stones over a small arch, the water of the river flows underneath the floor and a net could be lowered through the trapdoor in the floor to catch fish while the monks warmed themselves by the fireplace. It is believed a line with a bell was connected to the monastery kitchen so the cook knew when fresh fish was caught. After visiting Cong Abbey, be sure to stroll around the quaint town of Cong and take a peek at the Quiet Man Cottage Museum and the new statute of John Wayne and Maureen O'Hara. 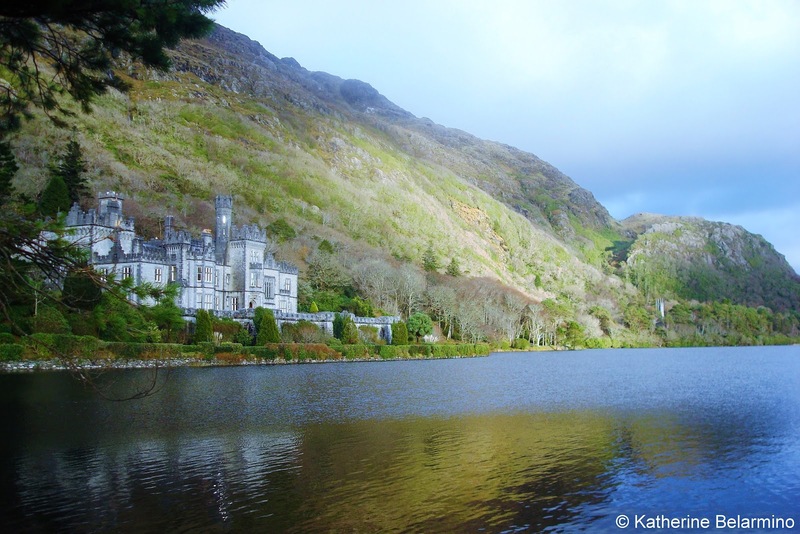 Kylemore Abbey is one of the most recognizable sites in Ireland as it graces the cover of many a guidebook. Kylemore Abbey can be visited while driving the Connemara Loop in County Galway. The landscape of the Connemera peninsula is striking and Kylemore Abbey is the icing on the cake. Kylemore Abbey is the oldest of the Irish Benedictine Abbeys and has been inhabited by a community of nuns since 1920. Some of the rooms of the abbey, which was built in the 1860s, can be visited, though much of the abbey is private as it is the residence of the nuns. The gardens and Gothic Church are also open to visitors. During our Ireland road trip, we stayed three nights in Dublin, three nights in Kilkenny at the Butler House, three nights in Kinsale at The Old Bank Town House, two nights in Galway at The House Hotel, and our final night in Drogheda (just outside of Dublin) at the Scholars Townhouse Hotel. This article contains affiliate links. 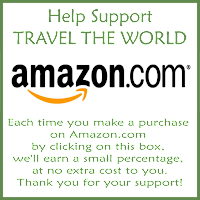 If you book through them it costs you nothing extra and we earn a small commission which goes towards maintaining this website and bringing you more travel stories.